Sometimes I get a moment of clarity. They seem strange in coming, so I’m trying to get better at writing them down. My five year old is very excited about Pajama Day at her school. It’s Wednesday. She asks about it every day. Today she asked me about tomorrow (Sunday). “Daddy, what do we do tomorrow?” “We will see Mommy at church” (Mommy has been gone). But, then she had a bright notion, “Daddy, is it Pajama Day tomorrow at church?” I thought this was a spectacular thought, so much fun, I’m glad she isn’t given to the logical fallacy of either/or when it is unnecessary. Then I thought that this is a good example of why churches cannot celebrate many things. 1. To Celebrate often excludes. Take Pajama Day as a brilliant, but doomed-to-exclusivity-failure as an idea. We do Pajama Day, we figure out the right breakdown of when it would be awesome (for Caroline and other 5 year old), when it would not be fun (for say 9 year olds). We determine a date (have you ever tried to do this with an organization of several hundred people, most of them invested, few of them paid?). We Advertise on Sundays, we send emails, maybe a snail mail post card, we put it on Twitter (yes, we Twitter), We put it on Facebook (Still Relevant? ), we make phone calls. Then, someone forgets. And they feel left out. Fail. 2. To Celebrate often reminds us of ghosts. Someone has probably been hurt by their pajamas. What a great illustration Pajama Day is (thanks Caroline)! Most of the time when you celebrate something you will bring up negative events, old stories, and people now have a row of other people ‘sitting with them’ in church. People they are probably not really sitting with for a host of reasons. All because we wanted our 5 year olds to get to wear their pajamas to church. Then they email people. Or leave. 3. We probably won’t celebrate Pajama Day well. Caroline is disappointed. We aren’t a school. We aren’t a day Care. We do those things because it is a joy to partner with parents in raising their kids, but when we reach out towards amazing events like Pajama Day we aren’t as good at it as those with more Night-Time-Apparel-Experience. We try, but we are mostly a volunteer organization and our volunteers are already stretched. 4. Someone else is already doing Pajama Day. This is often a bad reason. But, why do we need to replicate every brilliant idea? Not only will someone else do it better, but someone else is already doing it. Should we just advertise for them? This may not seem to fit because ‘shouldn’t we celebrate good things like Pajamas?’ I think it fits. I’m not sure it is the role of the church to celebrate all things. 5. We have a short amount of time to try to make much of Jesus. The 10 Commandments say Love God (1-4) and love People (5-10); Jesus, when asked to summarize the Great Story, ‘Love God love people’ (Matt. 22:37-40 amongst other places). Everybody worships – with their minds, hearts, voices, checkbooks, time, talents, sweat – and church exists to encourage/remind where that worship is best centered. Pajama Day is such a cool idea. But, I’m not sure we should do it as a church. 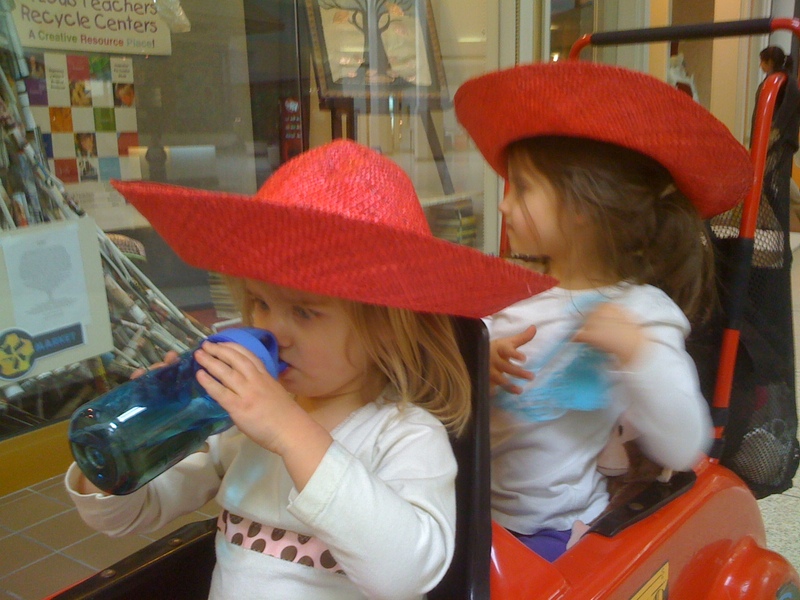 This goes for Sombrero Day too… We found these at the teacher’s Recycling Center and it is getting too late to find a better picture. I’m going to let you tell my 5 year old though!